If they say anything at all, probably more people in the world, when asked to name one WWII airplane, will name the Mustang. It has to have been the most successful piston engine fighter ever built. It wasn't built in the largest numbers, but it has been operated by more countries for the longest period of time as an operational military fighter than any other. The last military Mustangs were operated by the Dominican Republic, which retired theirs into the hands of eager collectors in 1972. The Mustang's popularity continues today with over 100 aircraft actively flying and many more being rebuilt from wrecks. Despite losing one every year or so to inexperienced pilots, there seems to be enough around to keep flying until the authorities decide to ground them. 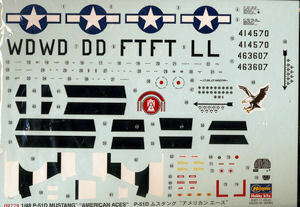 Hasegawa, the rebox king has brought out yet another decal options for its popular P-51D Mustang kit. The kit itself is very nicely molded and comes with a wide selection of optional bits, some of which are appropriate to some kits. It includes two styles of canopy, two styles of propeller blade, 'paper' and metal drop tanks, under wing rockets, under wing bazookas, and under wing bombs. There is is a nicely done interior with an accurate seat, some sidewall detailing, and the very visible fuselage fuel tank with the radios atop it. A full radiator and ducting are included and the aft cooling vanes can be positioned open or closed. I almost forgot to mention that one has the option of shrouded or unshrouded exhaust. The kit would have you open up holes in the bottom of the wing for the rockets or bazookas, but to be frank, I doubt that either decal option used those. I had always thought that the rockets were launched from stub mounts, yet these have a rail in between them. I'm also not sure that the paper drop tanks were used that much in the late war period, but at least you can put them on if you wish. Another interesting bit is that the small machine gun tips are separate items instead of being molded in place as on other Mustang kits. Instructions are well done and provide color information via Gunze paint references. There are a number of detail drawings regarding the installation of all the different ordnance options. Markings are provided for two overall unpainted metal planes with OD anti-glare panels. First is the box art aircraft of Capt Ted Lines fromt eh 335 FS/4th FG. This has a red nose and black ID bands on the wings, fin and stabilizers. I've not seen these markings before so it is nice to have them. The invasion stripes are included as decals, though painting them may be easier. The other is Glenn Eagleston's plane from the 353 FS/354 FG. It has a gloss yellow nose and spinner along with his rather large tally. Decals are well done and appear to be the newer type so should work well with your choice of setting solution. Amongst modelers, there are those who think the Tamiya kit is the best because of the ability to lower the flaps and allegedly better detail. 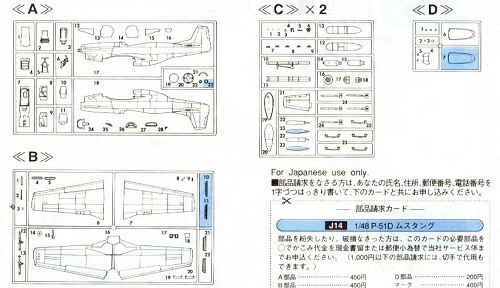 Hasegawa Mustang fans will point out that the Tamiya kit's detailing is over done and does not look right. Regardless of how you feel about it, the Hasegawa kit is well made and has pleased thousands of modelers who are more than happy with the results they get from it. Someone must be doing things right as these kits don't stay on the shelves very long. My thanks to www.dragonmodelsusa.com for the review kit. You can get this fine kit at your local hobby shop or ask them to order it for you.